2 By Sea, 1 By Land. The 3rd recovered Falcon 9 booster has joined her siblings inside SpaceX’s gleaming new processing hangar, laying side-by-side at Launch Complex 39A at NASA’s Kennedy Space Center (KSC) in Florida. What was once unfathomable science fiction has turned into science fact. In the space of 5 short months, SpaceX has recovered three of the company’s spent Falcon 9 first stage boosters following successful rocket delivery launches to orbit for NASA and commercial customers. The trio of landings count as stunning successes towards SpaceX founder and CEO Elon Musk’s vision of rocket reusability and radically slashing the cost of sending rockets to space by recovering the boosters and eventually reflying them with new payloads from paying customers. Over the weekend, the latest Falcon 9 booster recovered after nailing a spectacular middle-of-the-night touchdown on a sea based platform, was transported horizontally from a work site at Port Canaveral to the SpaceX rocket processing hanger at pad 39A at KSC. Check out the extensive gallery of up close photos/videos herein of the boosters travels along the long and winding road from the port to KSC from my space photographer friends Jeff Seibert and Julian Leek. As well as booster trio hangar photos from SpaceX. “Three’s company,” tweeted SpaceX’s Elon Musk, after the third booster met the first two inside the pad 39A hangar. The 156 foot tall booster safely soft landed on the tiny drone ship named “Of Course I Still Love You” or “OCISLY” barely nine minutes after liftoff of the SpaceX Falcon 9 a week and a half ago on a mission to deliver the Japanese JCSAT-14 telecom satellite to a Geostationary Transfer Orbit (GTO). The upgraded SpaceX Falcon 9 soared to orbit on May 6, roaring to life with 1.5 million pounds of thrust on a mission carrying the JCSAT-14 commercial communications satellite, following an on time nighttime liftoff at 1:21 a.m. EDT from Space Launch Complex 40 at Cape Canaveral Air Force Station, Fl. The used first stage then carried out an intricate propulsive soft landing on the waiting ocean going platform located some 400 miles off the east coast of Florida. The booster was then towed into the Florida space coast at Port Canaveral where it was removed from the barge, defueled and had its four landing legs removed. Thereafter it was tilted and lowered horizontally and placed onto the multi-wheeled transport for shipment back to SpaceX launch facilities at the Kennedy Space Center. The newly recovered first stage joins the fleet of two others recovered last December and in April. To date SpaceX has recovered 3 Falcon 9 first stages – 2 by sea and 1 by at land. But this was the first one to be recovered from the much more demanding, high velocity trajectory delivering a satellite to GTO. The first rocket was flying faster and at a higher altitude at the time of separation from the second stage and thus was much more difficult to slow down and maneuver back to the ocean based platform. Musk and SpaceX officials had openly doubted a successful outcome for this landing attempt. Nevertheless it all worked out spectacularly as seen live at the time via the SpaceX launch and landing webcast. However, the booster and the Merlin 1D first stage engines did sustain heavy damage as seen in the up close photos and acknowledged by Musk. “Most recent rocket took max damage, due to v high entry velocity. Will be our life leader for ground tests to confirm others are good,” Musk tweeted. So although this cannot be reflown, it still serves another great purpose for engineers seeking to determining the longevity of booster and its various components. “A few pictures show some signs of distress, this obviously was a rough re-entry,” Seibert told Universe Today. 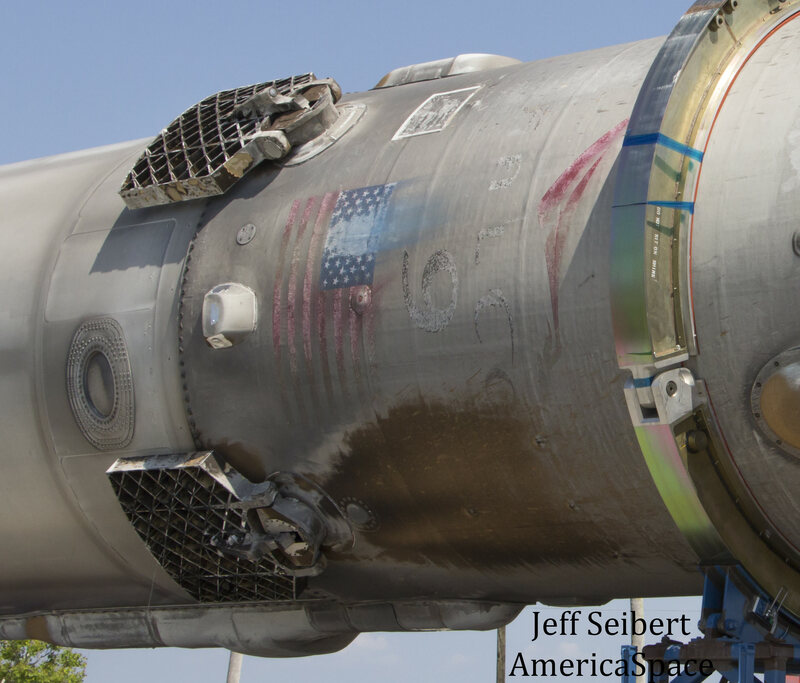 Damage to the booster may be visible. Looking at the Falcon 9s Merlin 1D engines arranged in an octoweb configuration, the center engine appears to be held in place with restraining straps. Musk says the next SpaceX commercial launch is tentatively slated for late May – watch for my onsite reports. Blastoff of the first reflown booster could follow sometime this summer. The fact there is damage to the rocket and it was STILL able to land properly makes this even more amazing. Making something work when everything happens as advertised is one thing, having something work when you have a hard re-entry, a booster not being fully supported, and structural damage is nothing short of awesome. Those are not crack marks but soot accumulation. If you zoom in you will be able see clearly.